Looking for a senior living facility near you? Let AvantGarde help you. AvantGarde Senior Living and Memory Care is a luxurious senior living community in Hollywood, California. We strive to exceed each resident’s expectations with our quality senior care. We understand that older adults have a unique set of interests, needs and goals. Our luxurious living arrangements suit each resident’s lifestyle. Our personalized approach to care and support enables the elderly to stay happy and healthy life in a safe environment. Our aesthetically pleasing, practical and cozy apartments are designed to ensure residents live in comfort. Our senior living facility features a courtyard, golf course, barber shop, beauty salon, general store and more. It is also equipped with state-of-the-art technology for safety and security. Loneliness and isolation can hit older adults hard. It can take a toll on a person’s physical, emotional and mental health and well-being. We provide a variety of engaging and fun group activities and events regularly to help our residents develop new connections and pursue their interests. Our kind, wonderful and caring staff is dedicated to providing the highest quality care to seniors. They treat each resident with a great care and attention. Have any questions or suggestions? We will be happy to hear from you. 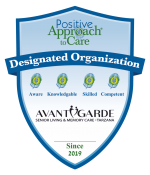 For exceptional senior living in Hollywood, contact AvantGarde. Take a look at our senior living facility from the comfort of your home.